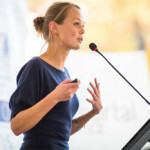 Have you ever heard a truly boring speech or presentation? When I was in high school, the powers that be made us listen to movies about smoking and other dangerous behavior. The films had the look of scientific presentations, complete with a guy in a white coat talking like a geek. These were Boring—with a capital B.